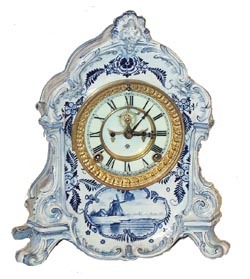 Ansonia Clock Co. porcelain, "LaRamba", ca 1904. Made in a blue delft case, Dutch scenes, lions head on top, paw feet on the base. 8 day movement, strikes half hours on a coil gong, running. The case is 12 inches high, has the German firing marks on the back, but like all the delft cases, has no model name fired or marked on the case. Of course, everyone knows it is the "LaRamba", sometimes also called the "LaRambla". Nice 2 piece porcelain dial, open escapement, French sash, beveled glass. The clock is polished, shining, clean inside and out. From the large collection of Ansonia clocks we acquired last fall. Ly-Ansonia No. 2580.